It's imperative to correct some misguided folks who only look for loopholes during Mazi Nnamdi Kanu's broadcast, hell bent on twisting his words to drive home their mischievous messages which is birthed out to instil confusion in order to drive home their devilish agenda. People who do not understand, would never comprehend the versatility of IPOB. Mazi Nnamdi Kanu is a man endowed with wisdom and uses every intellectual prowess within his limit to set his people free from the murderous Fulani caliphate/cabal chains that has not only bewitched the so-called Igbo Leaders but has rendered them politically impotent. The much debated 12th, Jan, 2019 broadcast and the broadcast prior to that where MNK allegedly backtracked on Election boycott specifically on Abia and Ebonyi, are STRATEGIC measures to set his people free. Prior to that much debated broadcast, recall that 51 Jewish adherent protesters were arrested and locked up under the command of the Governor of Abia Okezie Ikpeazu for merely protesting peacefully. In the lead up to that event, Mazi Nnamdi Kanu on Radio Biafra issued a 3 days ultimatum for their release during his broadcast from the Holy land of Israel. As expected, it fell on deaf ears. Fact is, people who think out of emotions are easily misled. IPOB is very versatile in the pursuit of Freedom for Biafrans. IPOB had to re-strategize. It was time to use every measure within reach to achieve the necessary goals. Recall it is this same South East Governors/Ohaneze Ndi Igbo that invited Operation python dance into our peaceful land to kill our people. Operation python dance 3 is about to be launched in same peaceful Biafra land, and one begin to ask If the Igbo leaders are under any spell? In a time when the whole South East Governors, Ohaneze Ndi Igbo led by Nnia Nwodo have been totally enslaved by the Fulani caliphate through monetary offers, IPOB needed something harder to drive home her message. It was to issue a threat that IPOB would not only vote but make sure they sleep in the polling units to make sure the likes of Dave Umahi, and Okezie Ikpeazu are voted out and flushed out from Biafraland. This, was a "mind game" which proved successful, as 2-3 days after this broadcast, 51 Jewish adherents were released. The follow up was former Governor of Imo state Ohakim pledged his unalloyed support for IPOB. How desperate and funny, isn't it? Doesn't this portray the kind of chameleon leaders we have masquerading as Igbo Leaders? I won't be shocked if the likes of Willie Obiano, Rochas Okorocha begin to pledge allegiance to IPOB. To be candid, these Politicians care less about the masses, and are blown around like paper. This fight is between light and darkness. IPOB is that light everyone craves for, the collaborators in Biafraland against the emancipation of their people from Nigeria are unquestionably the darkness. Don't be misled! 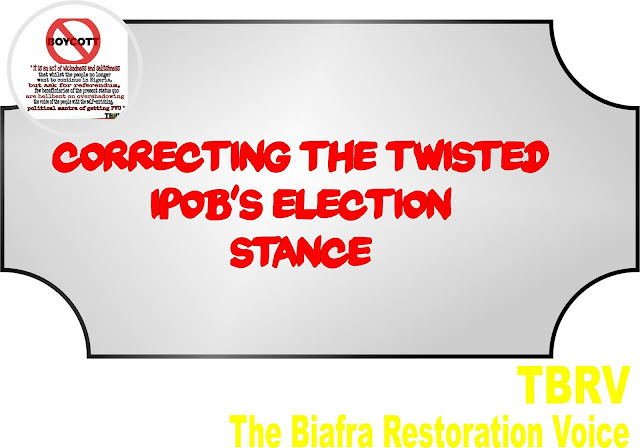 IPOB stands for Elections boycott, most especially the forth coming Presidential Elections. The goal is to restore Biafra using every means possible, and IPOB can't be deterred by political gimmicks from toothless keyboard experts. Don't lose focus! Our aim is Biafra, we will protect our land through every possible measure. God bless Mazi Nnamdi Kanu!